J C Billy DavisJ C Billy Davis was born in Bentonia, Mississippi and was raised in the Delta Town of Belzoni before moving thirteen years later to Detroit. Excited by the raucous sound of the R �n� B bands that dominated the black airwaves and the booming club scene on Hastings Street, he took up the guitar and formed Billy Davis and The Upsetters in 1956 � a hot little group managed by a young Berry Gordy. Eighteen months later he was spotted by Hank Ballard who persuaded him to join the Midnighters. Together they recorded hit after hit and toured the country incessantly and it was during this time that he first met and befriended his close friend the young Jimi Hendrix in Seattle. In 1960, on the famous Peacock Label, he recorded a little number called �Funky Onions� as Billy Davis and The Legends. This was renamed �Spunky Onions� so as not to offend the religious right! Drafted into the army in 1962 he handed both his guitar and place in The Midnighters over to Hendrix and spent the next two years in Korea. Rejoining the Midnighters for a three year stint Billy then moved to New York and quickly became a sought after session guitarist, recording behind a multitude of artists like Joe Tex, Isley Brothers, Drifters, Ben E King and Millie Jackson and for numerous companies such as Atlantic, Budda, Dial and Polydor. Eventually he also signed for A&M recording an album as Billy �Guitar� Davis. In 1974 he moved back to Detroit and got out of the music business. Nine years later, together with Hank Ballard, they reformed the Midnighters and cashed in on the oldies circuit, which eventually led them to their last hurrah at the Hammersmith Odeon in 1987. 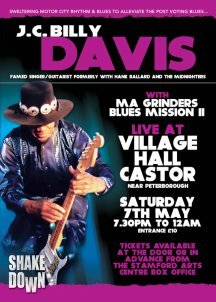 From them on he laid down his guitar, apart from gigs in local bars just for the fun of it, until in 2004 when he was coaxed out of retirement by No Cover Records and recorded the extremely well received �Blue Teardrops� album.